Of course when you are out and about in a foreign country you must eat. Some places you eat are decent. Some are amazing. Some are not so great, although we usually manage to avoid that. And some deserve their very own blog post. 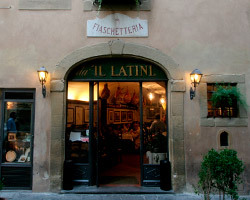 Il Latina in Florence is such a place. This is not just about good food, it is about an experience. If you don’t have reservations, then be prepared to wait for a while. While you are waiting outside you are brought appetizers and drinks. We had reservations that night, luckily. But even then, there is a HUGE crowd standing outside the opening to the restaurant jostling for position in anticipation for the 7:30 pm dinner opening. The space seems tiny when you are waiting outside, but they start to seat people by reservation and they take in more people than you could ever imagine would actually fit. Once you are ushered in the atmosphere is what hits you at first. There are cured hams and meats hanging all over the ceiling, creating a cozy atmosphere. There were so many people jammed into the small space, but they were all so jolly and thrilled to be there. The crowd seemed to be made up of equal parts tourists and locals, although more locals showed up about an hour later. The wait staff was plentiful and moved back and forth from the kitchen carrying large platters of food. It felt more like a festive family banquet than a restaurant. This is not your usual dining experience. There is no menu. There are no prices. The waiter we had was charming and friendly and immediately informed us of the appetizers, which they brought right out. He then proceeded to tell us about options for each course that followed. Their house wine is included, which was a total waste on us as we had no drinkers in our party that night. Even so, they presented us with a lovely bottle of red wine which I brought back to our villa for my step-sister. The atmosphere is vibrant and the food is delicious. For starters we were brought sliced prosciuttto with melon. I am not a huge cured meat fan but that was the best prosciutto I have ever had. The melon was perfectly ripe and what a delightful pairing it was with the salty meat. Then came tomato and basil bruschetta as well as bruschetta smeared with a liver pate. Options for the first course were ravioli and bread soup, a local specialty. For the main course we opted for the combination platter. Out came a platter heaped with pork, different cuts of beef, rabbit, and sausage. It was served with white beans and cooked greens. All of the meats were flavorful and cooked to perfection. The large platters are served family style. For dessert we also opted also for the family sampler platter, which came with different cakes and pastries. During dinner there was an endless supply of sparkling water. The service was cheerful and all the waiters had so much personality. After dinner an older man, who looked suspiciously like the older Alfred Hitchcock, waddled over to the table and spoke in Italian to our waiter. There was also lots of gesticulating. He then wrote out a receipt with a dramatic flourish. We got the receipt, and were quite curious, as so far, we have no idea how much we are in for. It was not itemized. It just had a total. A total with flourishes. So different than in the US. As we were eating we kept guessing how much this would cost us, and our estimates were pretty accurate. Since we got the combination platters and said yes to every course, our meal came to 40 Euro a person. Not cheap. But not outrageously expensive either, considering that we had all four courses. I will be patronizing this restaurant when I go back. I think my younger kids would get the biggest kick out of the atmosphere. And they would love the food. It certainly is memorable! “While you are waiting outside you are brought appetizers and drinks.” Now that’s an awesome restaurant! I know! Probably why everyone was so happy there! Thanks for the tip. I haven’t been here and it sounds great. Looks like you are super lucky and might have an opportunity to go there before I do! I just moved to Sicily and will be here for three years. I’m noting your recommendation for our trip to Tuscany (who knows when, but I know we’ll get there). I toured Italy for a month in 2005, and this is my husband’s first time in Europe, so we’ll be going all over the place, but I know Tuscany will be in the mix. Thanks for posting! Thanks for stopping by! And I would love to visit Sicily. Hopefully I will get to someday.